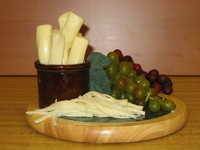 1lb of Ehlenbach's popular plain string cheese, flavored with extra salt. Goes GREAT with your favorite beverage! Service Area: Madison, Sun Prairie, Middleton, Milwaukee, Kenosha, Wisconsin Dells, Green Bay, Racine, Holmen, La Crosse, De Forest and surrounding WI communities.